Cake is Australian author Carmen Jenner’s latest release and is a laugh-out-loud funny rom-com with a delicious story line, witty dialogue and biting exchanges. Poppy Porter is a wedding planner up for the biggest promotion of her career. She also just so happens to be planning the wedding of her ex-fiancé and ex-best friend while simultaneously trying to uphold her duty as maid of honour in a wedding that might just break her heart. Oh and then there’s the best man…..Leo Nass, and the bane of Poppy’s existence since they were children. Womanizing, infuriating Leo who suddenly seems to be all up in Poppy’s business and making her body burn like it never has before. Poppy is determined to hold her head high and retain her dignity throughout the whole experience but with one disaster after another taking place, this wedding is turning out to be far from a piece of cake. It’s going to take all of Poppy’s scheming and determination if it’s going to go off without a hitch and perhaps a little bit of help from Leo too…..
Carmen Jenner has done it again! Written another hilariously funny, entertaining and witty story full of sass, sexual tension and delectable romance. Cake is just the most adorable novel that I absolutely devoured in one day. Capturing my attention from the very moment I began reading, Cake unfolds through Poppy and Leo’s POV’s and truly is so much fun to read. It was a quick and entertaining story and featured plenty of humour and some brilliant back and forth dialogue between the main characters. Both Poppy and Leo were really entertaining to follow. They had big personalities and were not shy in saying what they wanted or standing up to each other. A girl who absolutely loves cake is a girl after my own heart and in this novel, Poppy continuously stood out for her determination. Even if she was standing by people *cough* ex and best friend *cough* who were not very deserving of her loyalty, you still had to give Poppy props for not letting them destroy her. And Leo….ah, Leo. Leo was a very cheeky boy with a naughty mouth who knew how to push all of Poppy’s buttons and was always ready with a sexually explicit comment or quip. Romantically, Cake had all the sexual tension you could want. The chemistry between Poppy and Leo was undeniable and Carmen Jenner wrote some sharp and biting dialogue exchanged between them on a regular basis. Every time they were together Leo’s words and good natured jests worked Poppy up with hilarious results; she knew how to respond and it made for some very funny reading. The build up between them was addictive and so very satisfying when they finally went over the edge together. 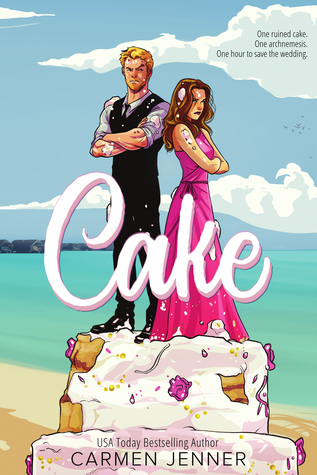 Quick but effective, Cake was a scrumptious read by Carmen Jenner and one I highly recommend if you’re looking for something light, fun and endlessly witty. This novel is one of her best yet, in my opinion, and Poppy and Leo are a couple who I'm going to think about with a smile for a long time to come! Final Thoughts: This is quite possibly my favorite novel by Carmen Jenner yet--it's just that enjoyable.